Despite what you may have heard, Phuket isn’t just for beach-lovers. It’s Thailand's biggest island, meaning you can divide your time amongst the gorgeous strips of shoreline, the hustle and bustle of downtown, and outdoor adventures in Sirinat National Park. Booking one of our Phuket holiday rentals is easy, and ensures you'll have your own private enclave to retreat to after a day at the beach or a night on the town. You can stretch out and take advantage of the extra space instead of sharing your holiday with hundreds of other travelers in a crowded hotel. After all, why not travel in style? Once you've arrived, you'll have everything the island has to offer right at your fingertips. The southern end of the island is laid-back and features some of the prettiest beaches in the area, while Phuket Town is where you'll want to head for a dose of local art and culture. 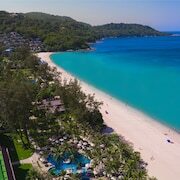 Look into short-term apartment rentals in Phuket so you have time to take advantage of deep-sea diving, luxurious shopping, fine international dining, and the signature white beaches and azure waters that Thailand is famous for. Of course, no trip to Thailand is complete without a Thai massage. A skilled masseuse will chase all your cars—and any lingering soreness in your muscles—away. 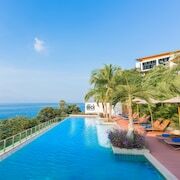 Booking your holiday rentals in Phuket is easy. Expedia has a large selection of holiday rental properties in the most desirable areas, so you can kick back and enjoy your very own space at a price you can afford. Just check out the available properties to find the perfect one, pick your desired dates, and then book safely and securely online. Then it's just up to you to make sure you see the side of Phuket that appeals to you. Pack your bags—it’s time to explore!